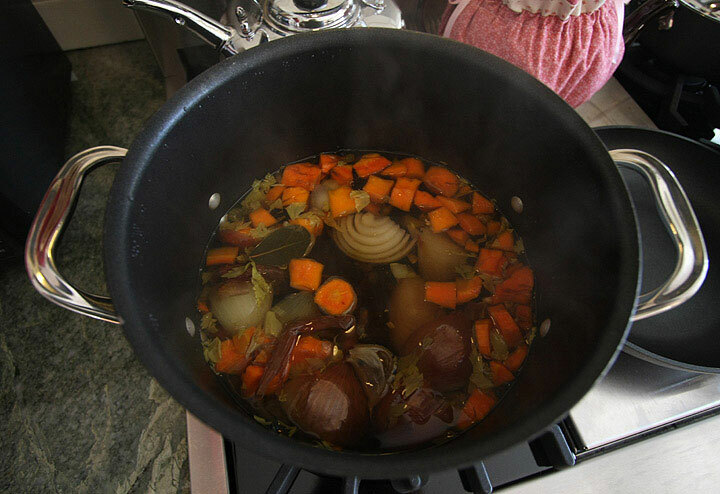 I use homemade vegetable stock in many of my recipes, and as the base for most of my soups. A can of prepared stock costs about $1.50 and I need at least 4 cans to make a pot of soup. Being $6 in the hole for broth alone kind of defeats the purpose of homemade soup, so I make my own. This is my base recipe, it can be adapted to whatever you’ve got on hand. Place everything in a stock pot and cover with 2-3 times the amount of water. Bring it to a boil. Reduce heat and simmer for 45 minutes to an hour.If I’m in a time crunch, I pressure cook it instead for 20 minutes. so how was the 10.00 “jug o wine”?? I love making veggie stock too, but I make it only as I need it. I like the idea of making it in advance, however I thought freezing it would be the best way to go for long term storage…Do you store yours in the fridge, and how long do you think it’s good for? LOL, Traci… it left me feeling surprisingly un-hungover the next morning(s), but I don’t recommend it! Betsy: I do store it in the fridge and so far it’s kept fine for a week or so. I don’t know how long it would keep, I go through it so quickly! Freezing would probably be your best soption for long term storage. LOL…my dad loves Carlo Rossi “Paisano”! It really is a tasty wine considering how inexpensive it is. 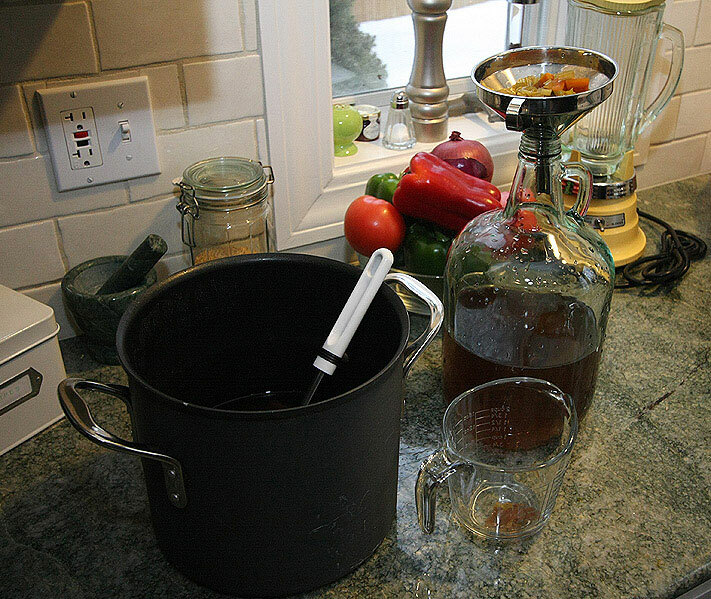 It also works nicely for making red wine vinegar (just leave a carafe of it uncovered for two to four weeks and it should become vinegar all on its own)! I now will be recycling his bottle for my own homemade stock as well!! Can’t wait to try your stock recipe.